It’s a simple way to make a big difference. A substantial amount of the electricity consumed in the U.S. is wasted through transmission, heat loss, and inefficient technology. This wasted energy costs families and businesses money, and leads to increased greenhouse gas emissions that accelerate climate change, and air pollution. These impacts, particularly increased greenhouse gases and air pollution, come with substantial costs to our health and to the environment. We can achieve significant reductions in illness and deaths if we improve energy efficiency and decrease economic and resource waste. This is where you, the health professional, comes in! 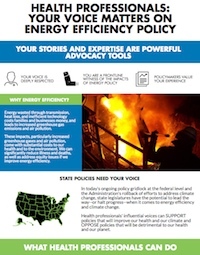 We need your prominent voice in energy efficiency conversations. As a health professional, you have an important voice to bring to energy efficiency policy conversations. You witness firsthand the health impacts of inefficient energy policy (e.g. treating asthma attacks exacerbated by air pollution from burning fossil fuels or working with families forced to suffer heat or cold because of high electricity costs). Your professional experience and on-the-ground stories are the best advocacy tools you have to influence decision-makers—we’re here to help you use the experience you already have to support healthier policies. 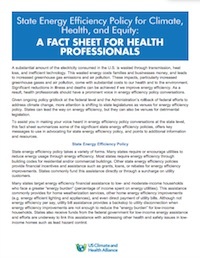 The fact sheet below includes a brief overview of state energy efficiency policy, examples of policies to support and oppose, and key talking points to use in advocating for health in energy efficiency policy. Whether you’re having a casual conversation with a colleague, meeting with a legislator, writing an op-ed, or educating others about this issue, the fact sheet gives you background and content to use. It also summarizes some of the significant state policies and procedures.